The first includes an audio recording of Baldwin singing “Precious Lord” playing on a loop, imbuing the atmosphere with the oceanic presence of Black American endurance and struggle. Anna Atkins and Anne Dixon, Papaver rhoeas, from a presentation album to Henry Dixon, 1861. Private collection, courtesy Hans P. Kraus, Jr.
Blue Prints: The Pioneering Photographs of Anna Atkins, on view at the New York Public Library through February 17, 2019, is an impressive contribution to master narratives on the history of photography. Atkins was a groundbreaking innovator working at the intersection of photography and science and the creator of the first book to be illustrated with photographs. 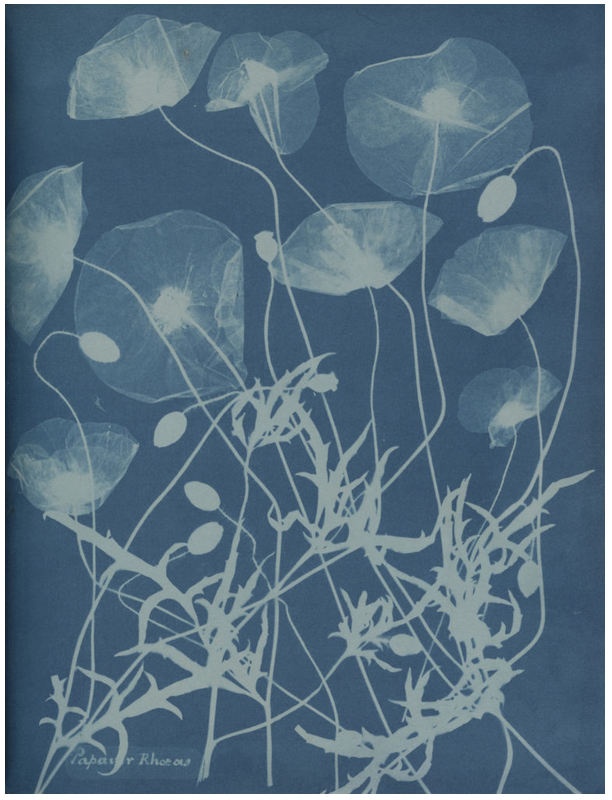 With this exhibition, she could finally receive widespread recognition for her use of the cyanotype process one year after its invention and her magnum opus, Photographs of British Algae, made in mid-1800s Victorian England. In 2018 Black visual culture not only permeated all realms of society, it successfully made the personal political — even universal. A new relationship to the accolades of fame, career pivots to activism and institution building, and sophisticated uses of adult play have converged into a wave of structural and ideological evolution that seems to be just getting started. Below are a few in a constellation of cultural activity both known and unknown. In photographer Mark Lyon’s second presentation of his ongoing Bay Views series, the relationship between external space and what Lyon calls “active interiors”, reveals the artist’s capacity for risk. Whereas his previous work offers a clearly delineated formal conversation between internal and external space, through the use of line, shape, symbols and concepts such as minimalism, Lyon’s 2018 collection compels viewers to surrender to alternating perspectives. In this age of political strife, what can fashion do? It can radically enliven, transform and counter staid social constructs around identity, gender and power. To that end, if your tastes lean toward non-conformity, theatricality and daring sartorial feats, then the collaborative fashion, design and photography project Soft Criminal will thrill and inspire you. Imagine an eclectic mix of the gender-free musician Prince; the Victorian era critique made by visual artist Yinka Shonibare; and, the iconoclasm of designers Vivienne Westwood and Alexander McQueen. For their first large-scale collaboration in New York, South African photographer Kristin-Lee Moolman, Sierra-Leonean designer Ibrahim Kamara and British designer Gareth Wrighton, created a series of garments and photographs for a two-week installation at Red Hook Labs in Brooklyn. The event kicked off with a live fashion show in a warehouse style space filled to near capacity with people who appeared to be equally committed to the agency that can be found in personal style. The project follows a loose narrative that documents characters in a fictional storyline revolving around three rival crime families. The photographs offer a fascinating mashup of cultural motifs. They were shot in the South African landscape and include a time warped mix of 17th and 18th century European style, machine guns, imperialism, and a nod toward 21st century understandings of the gender spectrum. 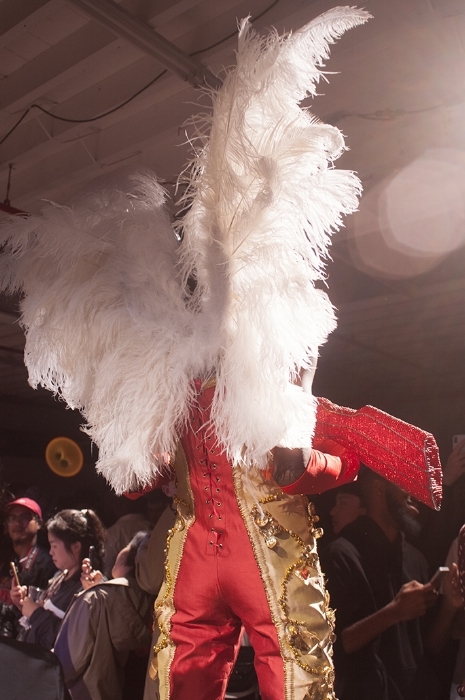 Several looks play on tight fitting breeches from the 1800s made in dazzling colors and the bare chests of black models, while hats and masks offer a dashingly fantastical touch. Extravagant wigs and shoes that exaggerate and futurize 17th and 18th century hairstyles and footwear abound. Think heeled cloth covered shoes with buckles or over a foot long curly toed court jester shoes. The landscape - dusty, rocky and barren under a pale blue sky - sets a backdrop reminiscent of planetary surfaces or the scarily real possibility of a “hothouse earth” scenario. However, the bold human swagger full of life and attitude that many of the models exude overshadows any sense of dystopia the photographs might suggest. An incredibly real melding of feminine and masculine aesthetics and real life bodies offers a tangible and expressive sense of a gender fluid world. The work of Moolman, Kamara and Wrighton is in fact much more than fashion. Significant ideas undergird their practices including: the touch of hand in the digital age (Wrighton), the mixing of cultural ideas (Kamara), and the creation of fictional mythologies based on the personal and political (Moolman). Working in direct opposition to the “fast fashion” of large global retailers, the garments for Soft Criminal were made by local African artists and artisans. As a whole, the avant garde and eclectic human touches involved in this project offer a compelling alternative to a future fashioned by artifical intelligence. The photographs and garments included in Soft Criminal are on view at Red Hook Labs through September 23, 2018. Malick Sidibé’s photographs are internationally recognized for their narrative exploration of identity and a particular swagger born of youth culture in 1960s Mali. Emboldened by their nation’s recent independence from France, his subjects confidently revel in their stature as members of an emerging modern decolonized nation. Intentionally human and unintentionally political, the Marie Tomanova: Young American exhibition at the Czech Center New York offers an insider’s view into a vibrant pocket of New York’s youth culture. 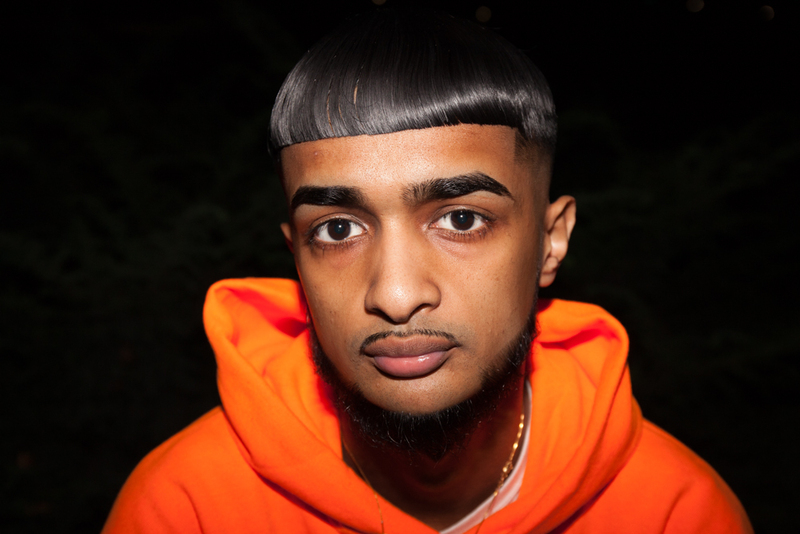 Orbiting around two epicenters, downtown Manhattan and Brooklyn, Tomanova’s photographs capture a diverse and eclectic range of young people that includes both migrants to the city and native New Yorkers.